NVIDIA releases its next-generation consumer-grade high-performance graphics cards featuring the new NVIDIA Turing architecture. The new NVIDIA GeForce RTX 20 Series graphics cards also feature the next-generation GDDR6 memory and the new NVIDIA NVLink Technology that replaced the old SLI technology. NVIDIA initially released three models during the Gamescom 2018 expo namely the GeForce RTX 2080 Ti, GeForce RTX 2080 and GeForce RTX 2070 graphics cards. 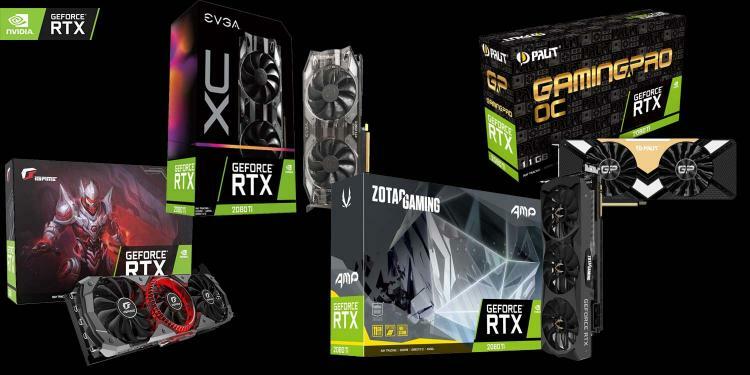 With the release, several partner brands also release their initial line-up of NVIDIA GeForce RTX 20 Series graphics cards. Check them out below. ASUS has revealed only RTX 2080 Ti and RTX 2080 GPU models as of this writing and product pages are not yet published in the ASUS website. COLORFUL, a China-based NVIDIA-brand graphics card manufacturer, lists one of each GeForce RTX 2080 Ti and RTX 2080 GPUs. EVGA has revealed two RTX 2080 Ti GPUs and two RTX 2080 GPUs. KINGPIN and Hybrid Edition Turing cards are expected to be presented soon. Learn more about the EVGA GeForce RTX 20 Series graphics cards here. GALAX, known for its Hall of Fame overclocking series graphics cards, also releases its take of the NVIDIA GeForce RTX 2080 TI and RTX 2080 graphics cards with White-coloured models. GIGABYTE has initially presented five GeForce RTX 20 Series graphics cards. GIGABYTE is also preparing for its AORUS-branded Turing GPUs to be revealed in a later date. GAINWARD also releases its models for the NVIDIA RTX 2080 Ti and RTX 2080 GPUs. GAINWARD GeForce RTX 2080 Phoenix "GS"
Gainward GeForce RTX 2070 Phoenix "GS"
INNO3D is the first brand to reveal a liquid-cooled NVIDIA GeForce RTX 2080 Ti graphics card – the INNO3D GeForce RTX 2080 Ti iChill Black Edition. Check out INNO3D’s line-up here. MSI initially lists four GeForce RTX 2080 Ti and 2080 graphics cards as well as teasing the upcoming VENTUS, AERO and SEA HAWK models here. Palit lists four NVIDIA GeForce RTX GPUs on its website. PNY, manufacturer of flash storage products and NVIDIA-brand graphics cards, also presented their lineup of GeForce RTX 20 Series graphics cards. ZOTAC GAMING GeForce RTX 20-Series consists of four models as of this writing.